Founded in 1997 Airport Van that operates under the name of Parishuttle is one of the main airport transportation service providers in Paris. The company provides either shared or private transportation between Orly or Roissy airports and downtown Paris or Disneyland recreation resort. Beauvais airport is also served. Parishuttle mini vans are dark silver-grey colored. Please find here under details about service and reviews of customers. 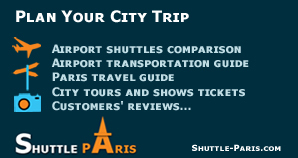 Ratings, informations and details about Parishuttle - Airport Van service. Operating hours: Service is operated 7 days a week 24h/24. Reservation department is open every day from 7am to 11pm. Toddler booster or baby car seats available on request. Kids under 10 pay 10 euros per way if shared ride. Review: What do you think about Parishuttle - Airport Van?